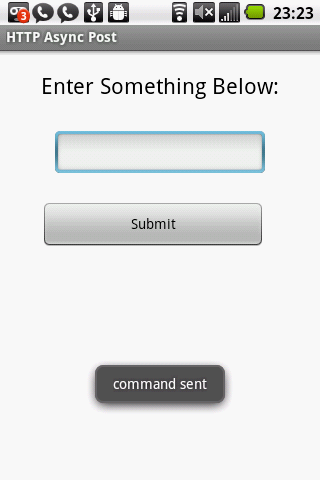 Let’s make an Android application to send a value that you type in a text box to a server script via HTTP post. We will handle the HTTP request in an asynchronous fashion so that the application does not freeze while the request is happening. Our application, shown below, will have a text box, a button, and a progress view so that the user knows that the data is been sent. Asynchronous HTTP application: sending data, a progress bar view shows the progress. After the value is sent a toast message will be displayed as shown below. As shown above, it simply consists of a button, progress bar, text box, and label. Now let’s link each of our views in the layout to code in java. Notice that we have turned off the visibility of our prograss, it will become visible only while the data is been sent. Let’s say that I want to POST the value from my app to the following PHP script stored in a server at some website. I can do that very easily from Android using the HttpClient class in a method that I can call with the value I want to send. The first parameter of the BasicNameValuePair constructor is the name of the HTTP variable in the PHP script, the second is the value that will be stored in $data. If you would like to post more values simply add another name-value pair line. If you just call the postData method created above, your application will hang until the whole HTTP process has completed. The correct way to handle this method is to use the AsyncTask class. We will create a class, inside the activity’s class, that extends the AsyncTask class. The method doInBackground needs to be implemented. Inside of it you put the code that needs to be handled asynchronously. Notice that we access the parameter of this method as an array, the three dots simply mean that we can pass more than one value when it’s called. Since we are only passing one value to it we just have to access the first array element, hence params is used. We will also add the optional methods onPostExecute and onProgressUpdate to track when the postData method has completed and its progress respectively. When the request has completed we will hide the progress bar and send a message to the user. Note: The values String, Integer, and Double of the AsyncTask class maybe be change to any other type to suit your needs. When the user clicks the button we will first check that he/she has entered something, then we will call our custom async class using by creating a anonymous object of it and calling the execute method with the value we want to HTTP post. This is the code for the activity all put together, enjoy.